This Hallowe'en things have got a bit exciting. 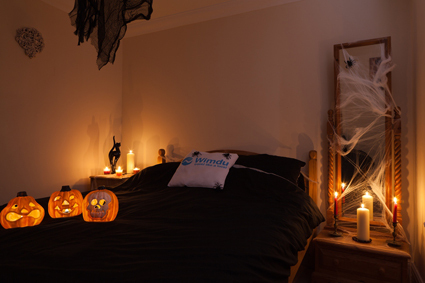 A few weeks ago I had a conversation on the phone with Wimdu, which runs a website dedicated to helping people rent their spare rooms to holidaymakers wanting an interesting short break. 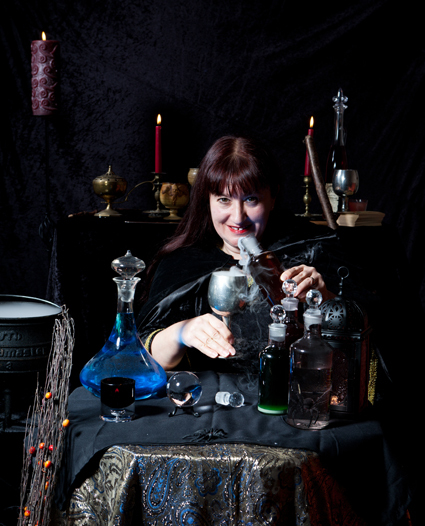 They had been wanting to do something very special for Hallowe'en, so finding a witch with a holiday home who was intending to let it out and who also wanted to give lessons in witchcraft, seemed uncannily like fate. Ever since my mum died, I've been the owner of two homes. Most of the time I live in the house I inherited in London, but I also have a beautiful flat overlooking the sea in Sussex. Wonderful, you might think, but the upkeep on two homes was more than I could afford, I discovered. Renting the flat out for holiday stays with Wimdu will hopefully be a good way to earn a bit of extra money. Wimdu was not only delighted that I wanted to list my flat on their website, they also wanted to photograph it - and me. So, a few days later a lovely PR person and a very nice photographer turned up with camera equipment for a full-on photoshoot. 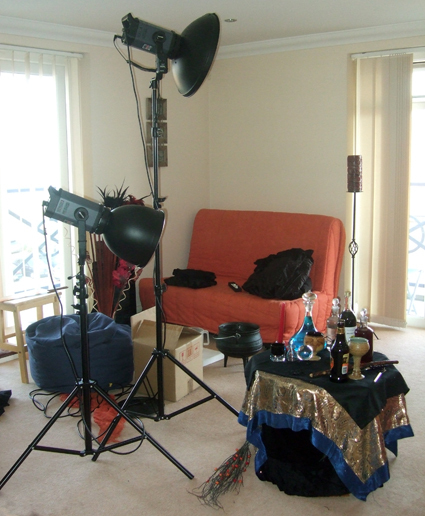 You can see some of the pictures they took on this post - as well as a pic I took while the flat was been set-dressed. I have to say, my flat normally looks quite modern - but all those black drapes, spider webs, pumpkin lanterns and dry ice are a fun way of decorating it for the Hallowe'en period. 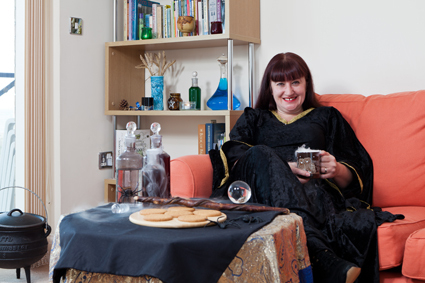 The robe I'm wearing, the chalices, tarot cards, wand, crystal ball and cauldron are things I genuinely use for magic. For many Brits, the biggest approaching event on the calendar is Christmas. However, for those that follow the Pagan calendar, the real event of the year is happening on October 31st - Samhain, more commonly known as Hallowe’en. 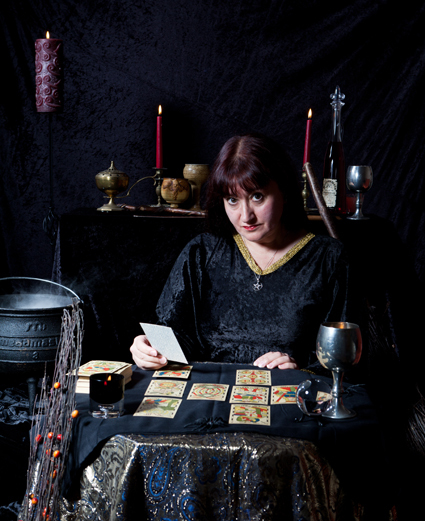 As well as providing guests with the comfort of her beachside property, Lucya will also give guests a brief history of Wicca as well as provide personalised Tarot card readings. For those who think they are up to the challenge, Lucya will help visitors create their own spells and they may even have the chance to mix up a potion or two. Guests will stay in the two-bedroom beach front flat located in Eastbourne’s prestigious Sovereign Harbour and enjoy gorgeous views of the English Channel. Sovereign Harbour also provides clear views of the full moon – the perfect setting for the pagan festival of Samhain. The Press have picked up the story and you can read what they have to say at the Daily Mail, Digital Spy and The Argus. Yay excellent. Hope it goes well. I also wanted to say thank you very much for the excellent blog, it's so nice to have a british based one that I can come visit. That chalice was a present my husband was given at least 15 years ago. I'm afraid I have no idea where it was bought from, or even who gave it to him.